Depending who you talk to, the actual flashing of an GOTEK drive with the Messsinger firmware is either easy or hell itself. Personally my GOTEK decdided to challenge me alot, but after a hile I won the fight. I spent several hours googling around, reading in forums and asked around among the friends I have. So to spare some of you the trouble I had, I decided to document and publish it. This guide could not have been done without the excellent job by Hervé Messinger. All the time and effort he has put in writing and debugging this code it is worth a lot for me and hopefully for you also since you read this guide. Respect his wish and do not sell GOTEK drives with his firmware on it! Windows 7 Pro/Home/Ultimate ( I used Swedish in this guide ). GOTEK Drive ( model SFR1M44-U100K was used in this guide ). STMFlashLoader ( Download it here… ). 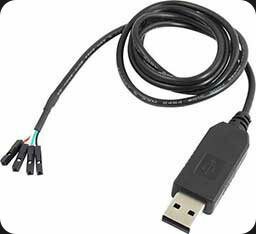 The USB-to-Serial cable I used is a very common one that I bought from Kjell.com with part number 87898 and I had to pay around $12,50 USD for it. Sadly the adapter does not work with Windows 8/8.1. For reference the adapter looks like this. 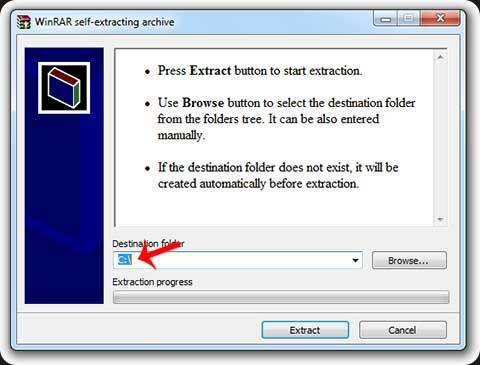 Extract CortexAmigaFloppy.exe by dubbel-clicking on the icon. A warning will be issued, click on “Run”. The GOTEK model SFR1M44-U100K has the following pin-out. Before you will be able to do any flash at all on the GOTEK you need to enable flashing by making short circuit “Flash Enable”. I prefer to solder pins instead of using the holes, you can find those at Kjell.com with the part number 87856. 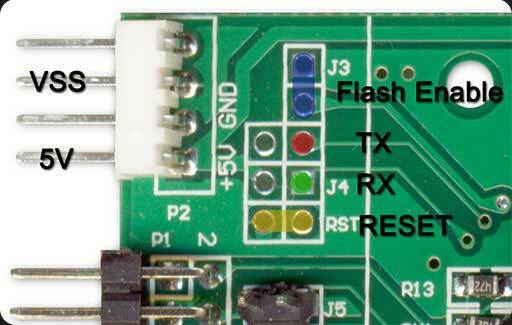 After the device has been put into “Flash Enable” you need to connect TX, RX, 5V and VSS, just as the picture below shows. If you are using the same type of USB-to-Serial adapter as I do, the connection should me done as the picture below. 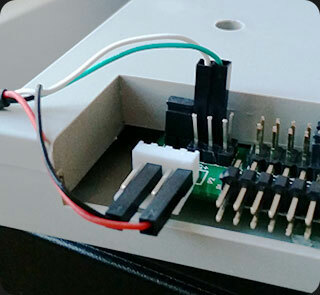 Many forums state that you have to use an external power source, such as the internal 5V from the floppy power. But using the 3.3V from the USB worked just fine for me. In my example below I will use COM-port 16, that might not be the correct port for you so please check your device manager in Windows 7 for what COM-port number the USB-to-Serial adapter has been assigned. Every time I use STMFlashLoader.exe I will use the option –pn 16 since that tells the STMFlashLoader.exe that I will use COM-port 16. Press the Windows + “r” key to show the “Run” window. Type in “CMD” without quotes and then click “OK”. If the de-activation was successful you will be able to see the following text. The STMFlashLoader.exe will reply with the following. Please, verify the boot mode configuration, reset your device then try again. Do a reset on the GOTEK by short-circuit “RESET”. I used a naked copper wire and had it short-circued for about 2 seconds. The same time that you release “RESET, press “Enter” and IF you are lucky the flashing will begin! Please notice that this usually takes some timing and might not work on the first try. When the timing is right and you manage to flash the device it will look like something similar. Q: The STMFlashLoader.exe informs that the GOTEK unit still is write-protected / Read-only. What could be wrong and what is the correct commandline command to flash? It seems that my guide had gone back to an earlier version where double dashes had been stripped away and the link was gone. Please download the file I have on my page and then do everything again. It worked great after some problems. First, thank you for this blog. Your shared information is gold. This question may sound crazy, but I try anyway. After you, have disabling the read protection would it then also be possible to “download” the original .Hex Gotek file down to your PC? I have a Gotek and Q6 Mossfet N Channel is blown. Would you have any idea what would be a working replacement Part number? I would like to try your firmware. But before I overwrite the original firmware, I would like to make a backup. Do you have an idea how I can backup the original firmware before? With original firmware you mean the one that the GOTEK is shipped with? yes, I would save the original GOTEK firmware. This was the only way I could get my GOTEK to flash. Everything else I tried would not work. I used stm32flash.exe COM3 (which is what my programmer showed up as) and got a good response describing the drive. I did notice that it was showing to use a baud of 57600, which may have been a problem with other methods. Then I used stm32flash.exe -k COM3 to disable read protection. Followed by stm32flash.exe -u COM3 to disable write protection. And finally, stm32flash.exe -w fw.hex COM3 to write the firmware to the drive. Then added the speaker mod, OLED mod and plugged it into my A1200 and all was fine. I don’t know what the “Messsinger firmware” is, but I re-flashed my Gotek with the “flash floppy” firmware. Used the ST tool, and it worked well. However, can’t get it to work in place of a conventional 3.5″ floppy on a plain-Jane PC. Get “not ready” or “busy” when I try to access it. Do you know if the Gotek works on a PC? Do you know of a spot on-line that might have a copy of the original firmware (installed on the Gotek when purchased) so I could try flashing that? See if I can get it to work on a PC? No, sorry I don’t know where to find the original GOTEK firmware. But what I do know is that FlashFloppy by KierF is said to work on a PC.